President Hu Jintao laid out the key steps in the next stage of China's anti-corruption campaign during a speech to a conference of the top disciplinary body of the Communist Party of China (CPC) yesterday. There will be four major fronts, said Hu, who is also the CPC Central Committee's general secretary, at a plenary session of the CPC Central Commission for Discipline Inspection (CCDI). They are to step up ethics education; to keep up the momentum of the campaign by routing out key offenses and high-level suspects; to address the problems that pose a great threat to the public interest; and to mend the official system and its procedures at the same time. At the three-day meeting that started on Monday, he pledged a severe and systematic crackdown on corruption. Hu told his audience of senior CPC officials and the 110 CCDI members that their task is still arduous; and called for an unrelenting effort to build on the success they had achieved last year. China's anti-graft fight last year led to the downfall of several senior officials, most prominently Chen Liangyu, the former CPC chief of Shanghai, who is implicated in a major scandal involving the misuse of the city's public social security fund. 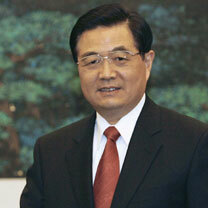 Chen was the highest-ranking official to fall in a corruption scandal in a decade. Today at the CCDI conference, it is likely that the public will be provided with an updated investigation report of Chen's case, which may turn out to be even worse than what people might think, according to some Chinese-language media. Two other high-ranking figures removed from their positions on corruption charges were Liu Zhihua, former vice-mayor of Beijing; and Qiu Xiaohua, former head of the National Statistics Bureau. In his speech yesterday, Hu called on officials at all levels to build a comprehensive system to expose and punish corruption as an integral part of China's economic, political, and cultural development. He ordered local officials to "solemnly implement" policies formulated by the central government and ensure the latter's "absolute authority", pointing to incidents in which instructions from Beijing were ignored by headstrong local officials. He also asked officials to improve their "work style", meaning they should be upright, modest, prudent, hard-working, frugal, and care more about the public interest. He said the CPC must make painstaking efforts to improve the education, supervision and self-discipline of leading officials.